Starting off the route with new, ugly shields. 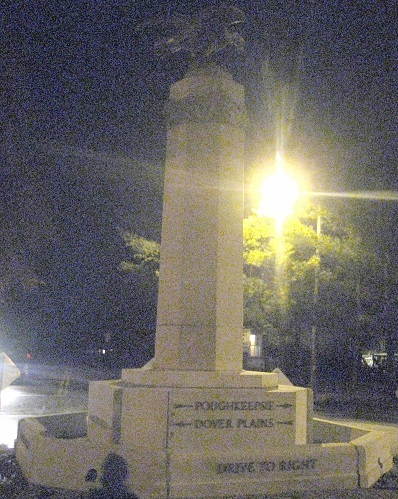 Older shields also had wide borders, but not this wide, and the parkway shields had smaller letters back then. The larger letters belong in a 3-digit width shield. 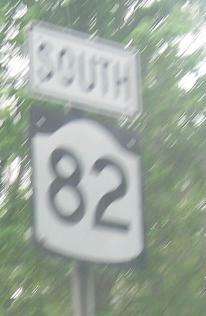 NY 82 once ended 1,000 feet east of where it currently comes into NY 343 (and former US 44). 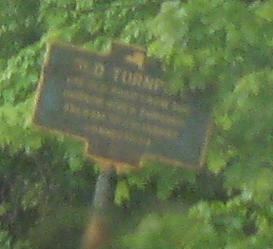 I know 343 (once numbered NY 200, just for your random information) was a turnpike through here, and 82 may well have been as well. 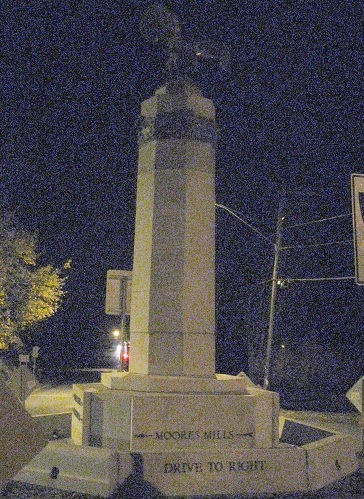 I don't know the age of this monument, but it could be as old as the latter days of the turnpike era. 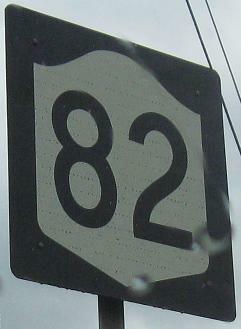 Photos start on NY 343 WB and proceed around the circle, ending on old NY 82 NB. The road to the north dead-ends, never part of any route and thus not signed from the monument. 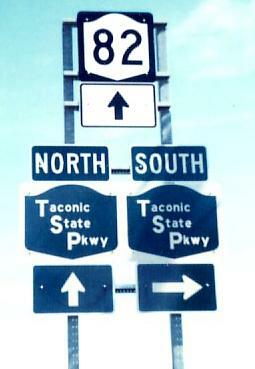 At the Taconic itself, back in 1975 courtesy Michael Summa. 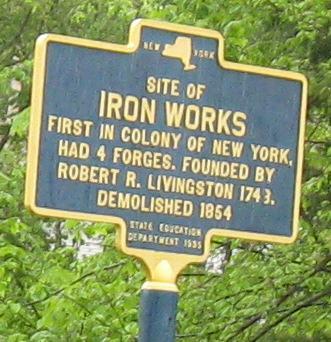 This is after New York realized that tiny lower-case letters (spelling out Parkway, even) just weren't legible. 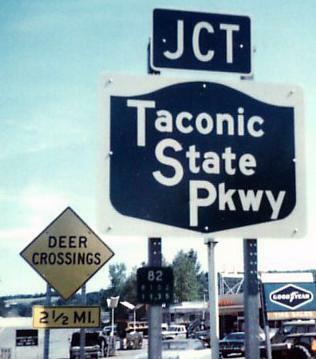 So maybe that first freeway-size sign is overkill, but they're all easy to read. If they were still here now, they'd look a whole lot older. 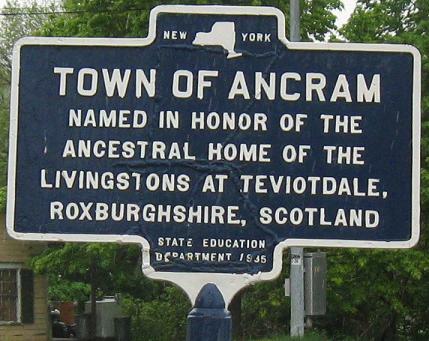 SB past CR 11 (second photo) to Ancram (third and fourth photos), firmly embedded in Columbia County. I cheated on the third sign, actually photographing the NB side of the sign as I circled around to get the best possible shot of the fourth sign. 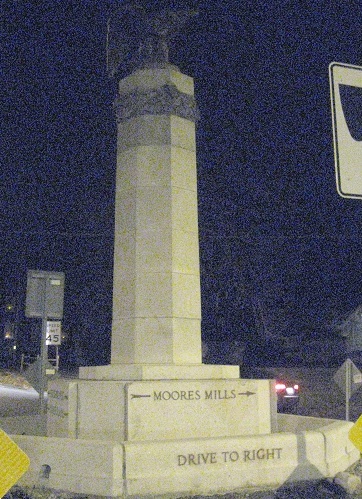 It looks like someone crashed into the sign and it was flattened and repainted instead of replaced. 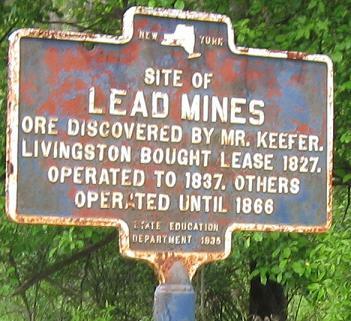 The lead mines are still in Ancram, heading south toward Dutchess County. 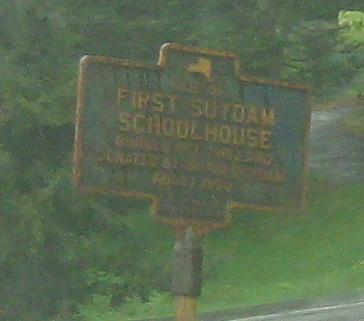 The name given to the intersection at NY 199, although it's rare to see such a thing signed. Especially when embossed. South from the short 199 duplex, compare this shield to the one on top. 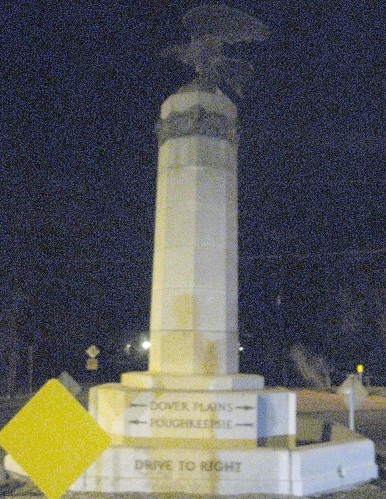 Instead of a V shape on the bottom, the contractor went with a U shape, resulting in a shield that looks like it gained some water weight.